Cruise the turquoise waters, colourful islands, and picturesque towns in Europe’s sunniest coastline. 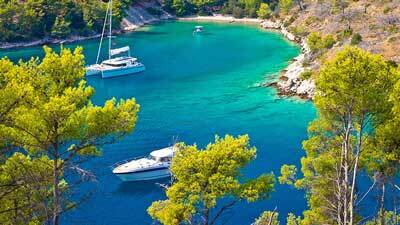 Visitors have been lured by Croatia’s 1,100 paradise islands and 3,600 miles of seafront since the 1970’s. Although the war of secession from Yugoslavia took its toll on the country (and tourism), today it is just as packed as ever with visitors from around the globe. Lord Byron once famously called the coastline of Montenegro the planet’s “most beautiful encounter between the land and the sea”. Within a short island hop you’ll find yourself in beautiful neighbouring country, Montenegro. Drink in the views as you cruise between islands and unspoilt coves, and experience the incredible food and friendly locals of the Adriatic Coast. Enjoy sunny days and avoid the crowds in the "shoulder months"of May and June or September and October. Most tourists flock to Dubrovnik in June, when the weather is scorching hot.